The very definition of appealing, our ORGANIC PEARL Sauce Bowl combines traditional design elements in new and unexpected ways. Made of decorative metal with the look of silver, it is great for serving sauces, gravies, hot dips, and salsas with characteristic Beatriz Ball panache. Pair with the small ladle, or any other ORGANIC PEAR pieces for a great set. 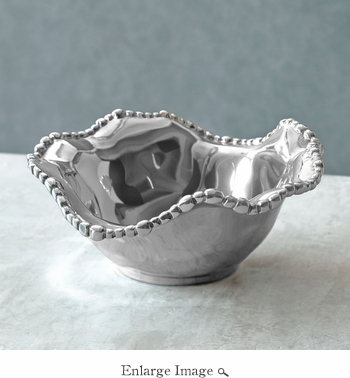 A gleaming silver bowl of hand-polished metal that makes a unique wedding gift, and a perfect present for a shower, holiday or birthday. Dimensions: 7 7/8" x 7" x 3"